Sofia is a very pretty lady. I like her blouse here - but those trousers...? I´m wondering what kind of venue that is. Looks like a shady club room hidden away in some sort of basement with all the pipes and with no window in sight. There surely must be better venues available if this is meant to be an official engagement for them in their capacity as princely couple. What are you talking about? As it is said above, the event is launching a podcast of the Princely Couple’s foundation, which concerns about cyber bullying and the dangers in social media and is mainly adressed to the younger generation. This is an important topic and Sofia for sure can contribute something because she was badly bullied in the media. The event took obviously place in a small theatre, theatres normally don't have windows. And what you see on the ceiling ist technique such as lightning behind the scenes. Also, I don't understand what this event is about. And the venue does look odd, including the decor, complete with a lamp (last photo) from granny's basement/attic. The blouse is too shiny but maybe with skinny pants would have looked better. @ Heather, once again, from what I see the event took place in a small theatre, the decoration was not set up for the couple's speech, it probably belongs to a play that was performed the night before. And what the event was about is said in the title above. The couple produced a podcast called 'Raiders of likes' where they want to educate young people on how to navigate safely in Social Media and inform about Cyber bullying. If you speak Swedish you can follow the link above and listen to their speech. I also think that the venue it's a bit strange. This doesn't seem to be a theater at all. There's a disco ball on the 2nd photo and a lamp right next to them on the 4th. They aren't in a stage either, it's something put on the grand so that people can see them. Anyway, not to sound negative, i will complement her blouse, i like it. I Love pastel/neutral colors. The trousers aren't the best but a black and white outfit it's a classic. Thank you, Beth. I didn't understand what was meant here by "raiders" and"likes". It's certainly a very worthwhile and timely cause. Beth - relax please. I´m not attacking them. I´m not questioning their project. I actually think it is an important thing to address as the cyberspace has its own dynamics which can spiral out of control. My remark was about the chosen venue, and I´ll stick to my view that it is utterly odd. That´s not a theatre, it´s not a public venue, it looks distinctly shady and club-like. And my point is that if they want this project to take of the ground and gain the recognition it deserves, they should launch it in a more professional way. An underground small room in someone´s basement is not a great choice. Also, if you want to discuss clothes, you need to see them in context. And I for one am unable to admire princessy outfits in a context/environment that is anything but. I think this might be a radio studio or something like that. It's a bit strange, yes, but I don't find the whole thing an issue here. What I find an issue is that Sofia herself did some pretty untasteful cyber bullying on her blog (of course no longer available, if anyone would think of requesting a link) about a teacher of hers. And no, NOT in her teenage years. As an adult. I find it uncomfortable that she just skipped to say a single sorry about that and yet they pick this exact topic as a pet project. Sorry, I can't just turn a blind eye on it. Anyway, I think her blouse is pretty. I don't mind the shiny fabric, she wisely didn't overaccessorized it so it looks absolutely ok for me. But I don't like the trousers. Basically not one of us who comment here like this kind of trousers on Stephanie (of Lux.) and I see no difference here: it's as unflattering for Sofia as for Stephanie. I guess simple slim trousers would have been great here. I think the place is some kind of youth center where young people can go and relax, probably also play performs. We have lots of places like that. They usually have very cheap donation furniture, young people paint places themselves etc. You are totally wrong! And you know it, you only want to be mean and hide it behind sarcasm. Carl Philipp and Sofia are young and the couple is totally approbriate dressed for the event, which was mainly attended by young people. The white blouse is beautiful and modern and suits her. It is totally possible to combine a wide cut trousers with this style of blouse. Maybe it would have looked a bit edgier with a slim leather jeans such as the model seemingly is wearing. By the way the event was about Cyber Bullying, this is exactly what comments like yours are about! Sofia is far more talented and successful than you might ever have been in your life. Keep your hate to yourself! Thank you beth, that comment was completely out of line and just plain mean. I like both of them and I support their foundation. I deleted the comment because I realized there would be commnets like this. I apologize if Im wrong, but my comment was far from bullying. It wasn't insulting. What is the point of writing only nice compoint? This is a blog. Someone likes her outfit, someone doesn't. The beauty is in the eye of beholder. That's the point. Lassie, yes everyone is allowed to have their own opinion, but what you said about Sofia was completely out of line. It went way beyond not liking her outfit and was just you looking for an excuse to be mean. You could have simply said "I don't like her blouse/pants" but no you took it further by saying how she was obviously trying to be something that she wasn't and that she had no talent. What does that have to do with clothes? Absolutely nothing! You clearly dont like Carl Philip and Sofia, which is fine because you have that right, but you make specific comments about them that are intended to stir the pot and then you delete your comments after people don't agree. You were also the person who started the catastrophic drama involving CP and Sofia when they were on vacation in South Africa. Then once again you deleted your comment. This blog is all about expressing your views and opinions about the fashion of the royal ladies, but there's no point to be cruel just to stir up some drama. Helen does a great job keeping us informed of the many engagements and activities and it's not too much to ask that everyone on here keeps it civil and respectful when commenting. One again, I apologize. I like them as a couple, you were wrong about that. I could have said what I meant in more politely way using thousands of words but that's how I write-short but with deeper meaning. You can understand that in a wrong way and I am sorry for that. 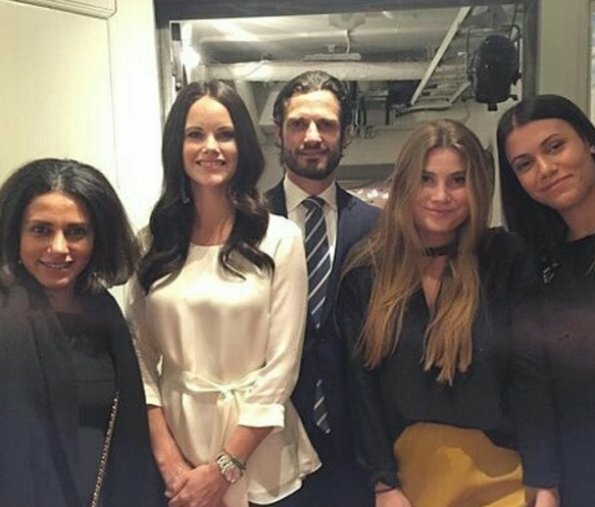 Wow talk about sad, Sofia and Carl Philip attended an event to try and speak out against cyber bullying and that's exactly what some comments on her are doing. Also kinda funny that now people have something to say about her blouse, when it's the EXACT SAME blouse that she wore last year in Varmland and no one had an issue with it. Yes the wide legged trousers dont look good paired with it, but to say that she's trying to hard to be something that she's not and that she has no talent is wrong. Sofia like a few other royal ladies can simply do nothing right in some posters eyes on here. 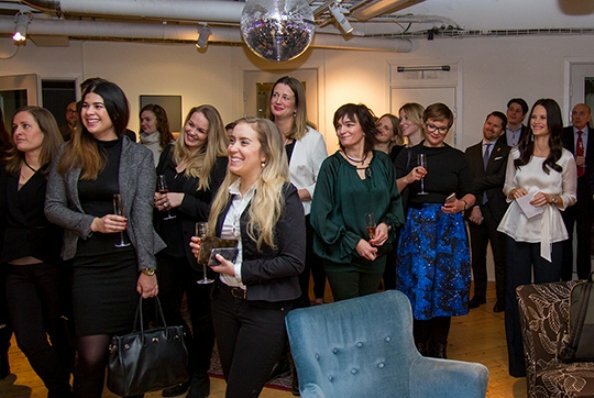 Also fyi the event was a PRIVATE event that was thrown in celebration of their podcast and they gave the royal palace permission to post it on the site because it was in connection with their Prince Couple's foundation. Who cares what the venue looked like. I think it isn't so reprehensible to comment on the venue if no explanation is given and maybe some people, like myself, who are not Swedish, had no idea what the event was about. Agree, the venue is a bit of a non issue, and confusion arises because there's not enough info given on the post about why they were there. It's ok to say that you don't understand why it looks like they were possibly in someone's basement because the venue does look kinda odd. I just hope that the looks of the venue doesn't take away why they were there, which was for a great cause. 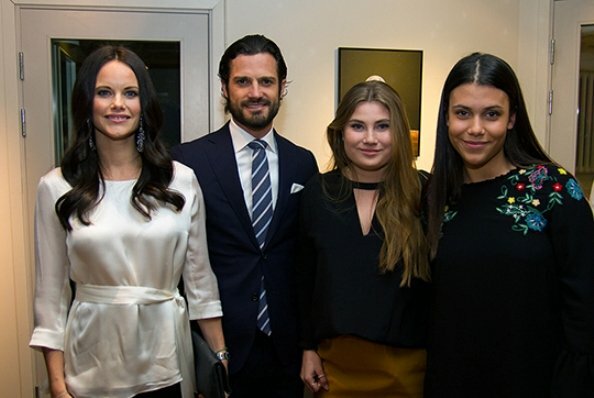 Love Carl Philip and Sofia, and like the causes they support. She is a beautiful person inside and out. Her blouse is nice (a little wrinkled)and her pants could be shortened a bit at the bottom. I have enjoyed P Sofia evolving her role within the family. These things take time. I am sure a theater is acoustically optimal for a podcast. I like how she is bringing "realness" to the princess role but please hem your wide leg pants...because they can be tricky! Yep she's awesome and Carl I'd a dreamboat beautiful couple with a very cute son!! 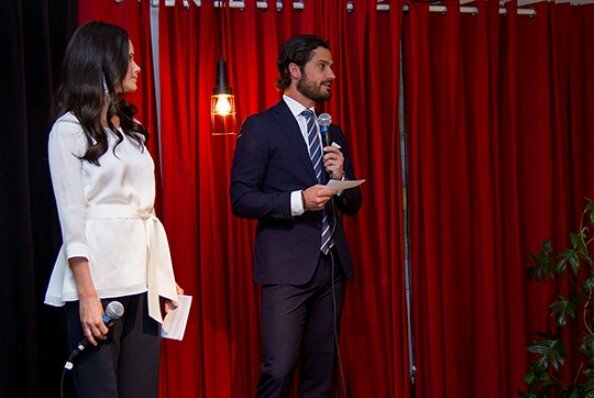 Prince Carl Philip and Princess Sofia always seem like such a genuine couple. I love her blouse, and she looks lovely; her hair looks especially nice with the loose curls! The blouce might have been better showcased with a more slimline trouser. But otherwise, she looks lovely ! Whenever you see them, they seem perfectly at ease and comfortable with whatever setting they're in. 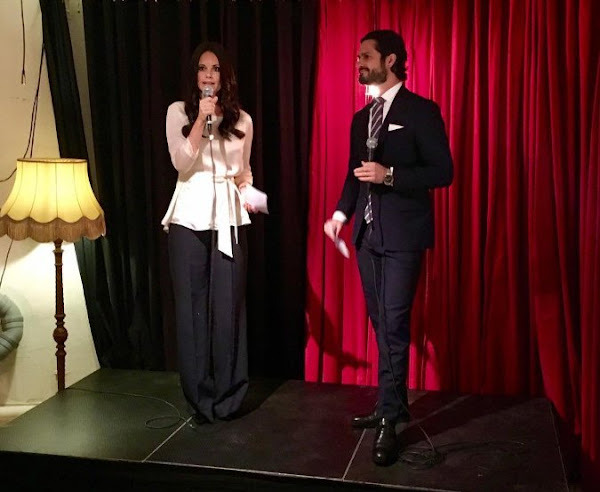 Can't have been easy for Sofia,(or any non royal) transitioning from private life into the spotlight of the SRF, but she seems to doing a good job, whilst still being herself. Every time there is a photo of the Prince and Princess the comment circus starts. Give the two a break. She is dressed for the occasion Carl Philip is wearing a suitable tie. The two are busy and not posing for family photos all the time!!! Of course the comments start. That is what public forums are for. They are public figures and represent Sweden. People will notice and comment on their actions and appearance. Thanks to the site owner to let us view and share our opinions. Great fun! When I write my comments I do not expect other people on the blog to agree with me . People have different taste in fashion, different mentality and different views. So much fun to follow and watch the Royal Families!